Start with the short drive to Bennington Center. When there, you have two options. 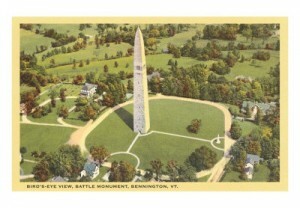 Either elect to visit the three-hundred foot tall Battle Monument first, or later, after the battlefield itself. In any case before you set out, please re-read Chapter 13 above. On rte 7 just north of Wiliamstown, you’ll pass by on the left “River Bend Farm,” originally the house and inn of Colonel Benjamin Simonds. Imagine now that this is early August, 1777, and you’re following his militia regiment of “Berkshire Boys” marching along the same road to Bennington to join General John Stark who has just arrived from Brattleboro with a large contingent of New Hampshire militia in order to protect the community from a threatened British invasion. General John Burgoyne’s eight thousand red-coats were indeed currently advancing south along Lake Champlain and Lake George, intent on severing New England from the rest of the rebelling colonies. You might then prefer to visit the Monument area first, because that’s where Stark’s and Simonds’ American troops were assembling around a large store of provisions, including horses, cattle and even bread baked in Williamstown. Rumor had it that Burgoyne might be sending a raiding party to seize these supplies. His own army, already far from its base in Canada and currently resting in Fort Edward after a long and grueling march was in dire need of food and horses. He had heard of the stores in Bennington, and erroneously assumed there was no American garrison there to guard them. While you’re tarrying to contemplate what was about to happen, take a short walk to the Bennington Museum on rte 9 just before Monument Circle (the museum is open every day except Wednesday, 10am-5pm; and on all seven days during September and October. It’s closed in January and on all major holidays). Here you will see many exhibits related to the history of Bennington and vicinity, and also a collection of paintings by famous Hoosick Falls artist, Grandma Moses. Also, stroll around the corner to the Old First Church of Bennington on Monument Drive. Browse for a few moments among the period stones in its famous cemetery; contemplate their mournful images and melancholy epitaphs, and likewise the grave there of Robert Frost. Cast another mournful look across the street at what remains of the once elegant, now abandoned Waloomsac Inn. In 1791, just after Vermont became the fourteenth state in the union with Bennington as its first capital, Thomas Jefferson and James Madison lodged there while visiting the new governor. 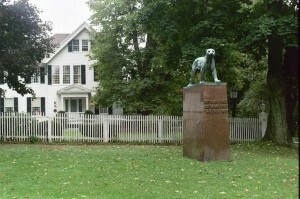 Now take a further short walk down Monument Avenue past several vintage houses, until you spot on the left a mounted bronze statue of a mountain lion. It replaces an actual stuffed “catamount” as called in Vermont, that once served as the sign of the Catamount Tavern, a popular pub run by Landlord Stephen Fay during the mid-1700s, and the notorious hangout of the “Green Mountain Boys. This was a rowdy gang of local farmers led by Ethan Allen, bitter foe of New York which claimed Vermont within its own colonial boundaries, and that Allen and his Boys were squatters who should be evicted from their New Hampshire-granted lands . That’s why the catamount faces menacingly in the direction of New York – a story for yet another summer tour which I’ll present to you later. For purposes of this trip, however, the former Catamount Tavern was also the place where General Stark held a war council on the eve of August 16, 1777 when he learned that a raiding party was indeed marching toward Bennington. He quickly decided to head off the British before they reached the town, reasoning that the enemy must be approaching along the road from Cambridge, NY. His scouts in fact reported that a force of some seven hundred “Hessian” (actually Braunschweiger) mercenaries and another hundred or so Indians and loyalist Tories had taken up positions on a hill just above the Walloomsac River near the village of North Hoosick, NY, then called Sancoik. General Stark with his fifteen hundred New Hampshire, Vermont and Massachusetts volunteers decided to engage the enemy there and attack him simultaneously from three sides. Now you can drive north again on rte 7, and turn left on rte 67 for eight more miles to the actual battle park. This is the same route that Stark’s troops followed to confront the Germans. You will pass several historical plaques along side the road designating the progress of the American army. One marks the place where the Braunschweig commander, Lieutenant Colonel Friedrich Baum, died after being mortally wounded during the fight. The entrance to the park itself is well-marked on the right side of the highway just before the village of North Hoosick. Unfortunately for state budgetary reasons, the site is no longer in full operation. While the gate is still open from 10am to 7pm every day this summer, the former park headquarters is closed, and a single attendant is on duty at the site only on Tuesdays, Wednesdays and Thursdays. Nevertheless there are a number of plaques and maps displayed there which explain the course of the battle. You might even be interested in returning on August 16 of this year, to help celebrate the 234th anniversary of the event, and witness a colorful reenactment by local buffs dressed in period uniforms and armed with eighteenth-century muskets. As you will read in Chapter 13 above, the American coordinated assault completely overwhelmed the Germans. The Americans, elated with their victory, then dispersed to collect the loot littering the field. At that moment however, unbeknownst to them, another fresh enemy regiment was just arriving; more Braunschweigers under Lieutenant Colonel Heinrich Breymann who suddenly fell upon the disorganized Americans and almost turned the tide. 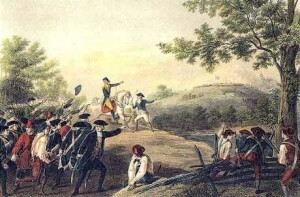 But just as suddenly, an equally fresh contingent of Green Mountain Boys under command of Colonel Seth Warner, cousin of Ethan Allen (who was at the time a prisoner of war, having been captured by the British at Montreal in 1775) rushed upon Breymann’s troops and routed them as well. In all, it was a glorious double victory. Nearly a thousand German mercenaries were taken prisoner, depriving General Burgoyne’s ever weakening army of nearly an eighth of its total. In fact, the demoralizing defeat at Bennington significantly contributed to the final surrender of Burgoyne’s entire force at Saratoga two months later (the objective of our forthcoming blue tour), the decisive battle that finally changed the course of the Revolution to America’s favor. As you return to Williamstown, contemplate what you might have witnessed right after the battle along the same route: a long line of disheveled German prisoners, handcuffed two-by-two, plodding dejectedly into distant captivity (a camp near Boston). Gawking local bystanders had never seen such a sight before. Not even a herd of “rhinoceroses” could have aroused more curiosity, one wag supposedly remarked.